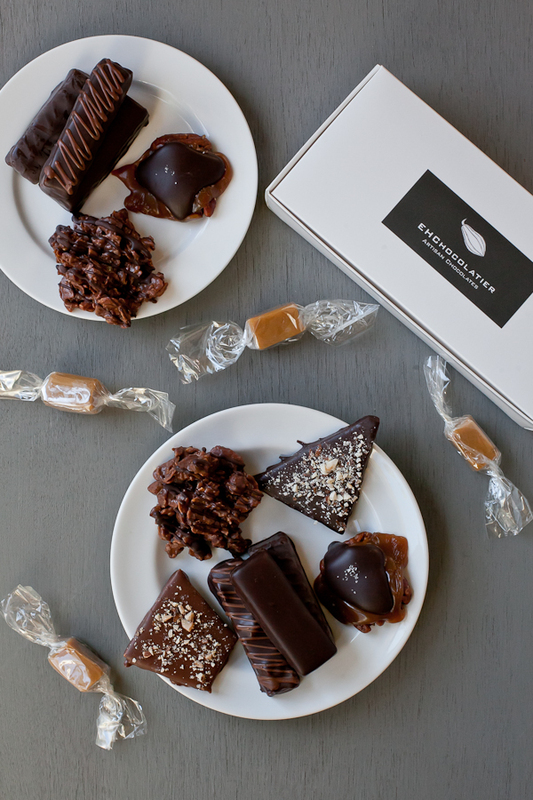 EHChocolatier in Somerville has won quite a few awards. The owners share the story behind their success, and one of their best recipes — just in time for Valentine's Day. EHChocolatier is doing big things in a small space — delicious, chocolaty things, to be specific. The store, on the second floor of a Somerville building, consists of a glass case and bookshelf in the corner of an industrial kitchen, but that hasn’t stopped co-owners Elaine Hsieh and Catharine Sweeney from hauling in awards at both local and national levels. EH has won Boston Magazine’s “Best of Boston” Chocolate award for the past two years, not to mention Best Chocolate in the U.S. from Food & Wine magazine and Best in the Box from the New York Times. Hsieh and Sweeney have got some serious talent, and lucky for the rest of us chocolate enthusiasts, they’re sharing it. I sat down with Sweeney to talk about EHChocolatiers and get the recipe for their chocolate ganache, a simple, creamy treat on its own that can also be used as the base for more creative concoctions. How did you and Elaine meet? We met in the summer of ‘99, when a mutual friend asked us to make her wedding cake. Neither of us had made a wedding cake before. Elaine was in culinary school at the time, but not making wedding cakes, and I liked to bake, but I wasn’t a cake baker per se. We didn’t know each other. She threw us together, and we actually made this cake. Of course, it wasn’t just any cake she wanted. It was a tiered cake with edible seashells cascading down the side. And her wedding was in Martha’s Vineyard, outside. So you’ve got this perfect storm going, and actually, everything turned out fine. Obviously, Elaine and I hit it off together. So of all the million food items you could focus on, why chocolate? I love chocolate! Working with chocolate is a lot of fun, and challenging. There’s a lot of chemistry behind it. It’s great learning. It’s a beautiful medium. Never-ending challenge, really. People just won’t stop giving you two awards! What’s your secret, if there is a secret? I think it might just be the detail that we put into it. It might take like eight tries to develop a new recipe so that it’s just right. One of the biggest things is just that it’s fresh. We make it small batch. So when you get it, it really hasn’t been around too long before you’re eating it, and I think that’s the biggest piece that helps us to stand out. Because over time, the flavors do dissipate in the ganaches. But if you get them right away, it’s wonderful. What made you decide to open this place? What made you decide to take that leap? So the first nine months, we actually weren’t here. We did just a friends-and-family club membership. Once a month, we got together to make all the stuff, and we’d ship it out to our friends and our family that ordered it. It gave us a way to see if we could really work together, to get your feet wet, so to speak, in the chocolate world, to see if we would enjoy doing it. And yes, we did! After that, we decided to come here, open our real commercial kitchen and get going. I remember we opened in November, five years ago, right before the holidays. We got what we would call a “big corporate order,” and we looked at each other. She was like, “Do you know who that is?” I was like, “No. Do you know who that is?” “No.” I’m like, “Who’s ordering from us who doesn’t even know us?” [laughs] That corporate order comes in every year now still. They’ve seen us grow. For recipes, you said it could take eight tries. How do you come up with new ideas? What is that process like? One example, I love Thai food. A couple of the ingredients that are found in a lot of Thai food are lemongrass and chili. I went, 'I bet those flavors would work well with chocolate.' So I got my fresh lemongrass and my Thai chilies, which are very hot, and proceeded to make really small batches. Try to get the flavors to come out in the right balance, like you want them. You read a lot, you see things. You’re always thinking, 'Would that work with chocolate?' And not that we have to be exotic — just good. We just need everything to be the best it can be. We’re still working towards that! I think we’d still like to grow and possibly open an actual brick and mortar shop. Anything’s possible. … But big enough that we can actually make a living. [laughs] It takes a lot of work and people don’t necessarily understand what goes into making the product. Chocolate is like wine. The chocolates that we use are very high-end, very complex. When you let them just melt in your mouth, there are multiple layers of flavor that come through. I think that people need to be educated on that so they can really appreciate it. This isn’t a Hershey’s bar. So tell me about this recipe. The recipe is for a basic chocolate ganache. A ganache doesn’t have to be difficult to make, and you can do so much with it. A ganache is basically chocolate, cream, and butter. All the best ingredients in the world, right? Exactly. With the tea ganaches, you take that cream and you bring it to a boil, and you steep the tea right in the cream, and then you strain it out, and you’ve got tea cream. When you add that to the chocolate, it’s going to keep that flavor. You can add spices to it, you can add zests, you can add oranges, lemons. Anything you want. So this is a basic recipe that people can go anywhere with. This interview has been edited and condensed for length purposes. Nicole Fleming is the author The Girl Who Ate Boston food blog. Follow her on Twitter @GirlEatsBoston.